Replaced paper planes come new models that are made not only of paper, cardboard, foam, ceiling tiles and other lightweight materials. Production is on such a plane we'll do today. Will make the aircraft "Albatross" for his craft you will need cardboard and paper. Let's get started! Follow our step-by-step instructions. Download drawing model "Albatross" from the Internet. Cut parts, they are the template. Start making the main part of the aircraft, to the fuselage. You can do it either simple, or with transparent cabin. As you like, although the flying ability of the aircraft is not affected. The glazing booths can be done with a transparent film. 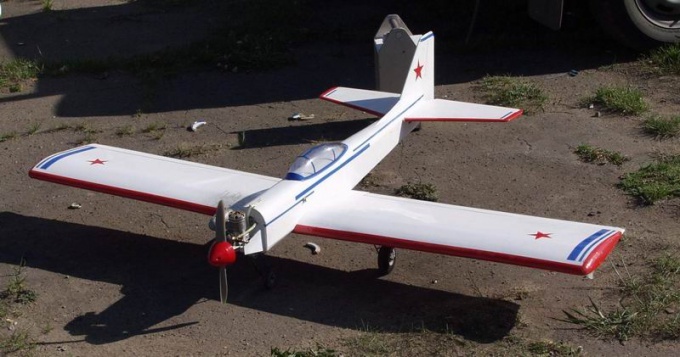 That plane flew well, you need to distribute the center of gravity of the model. Look closely at the drawing, it should be noted. Define the load, it can be cut out of cardboard or hardboard. Made cargo glue to the fuselage from the inside. To stick a load better in two stages, first to one side of the fuselage, then the other. Glue the fuselage together. Fold the bottom of the fuselage and glue the tabs together. Cut out the contour of the keel of the aircraft. Glue it on the trailing edge, the seam should be about 5-6 mm. Insert the tabs of the keel in the aft fuselage and glue them from the inside. Glue the engine of the plane to the side walls of the fuselage. Cut out the stabilizer and glue it on the trailing edge. Attach it under the keel in the rear. Cut and glue the wings to the fuselage, well, seal the folds of the wing. Fabricate a hook for this fit an ordinary paper clip. Flatten the ends of the clip. Attach the hook with glue to the fuselage ahead of the wing. Select the model on the table, when it is fully assembled. Press the wings and stabilizer books to better stick to these important details. Express the plane in this position for 8 – 10 hours. It is necessary that the glue has well dried out. Check the balance of the aircraft. Done correctly, the model must stand on the edge of the ruler. The plane is ready, go to test it. Before flight recheck the wings, stabilizer, rudder. You can start the plane in the air using a homemade slingshot. Gaining altitude is 10 m, the aircraft can fly about 30 meters High flight and soft landings!